Lois wakes up to find Clark missing from the apartment. She turns on the radio and learns why her husband isn't home. Downtown, Superman battles with Neutron. The villain threatens to release his radiation all over the city, but the SCU steps in instead. The new Technology Squad uses their technology to absorb Neutron into containment rods, leaving nothing but an empty suit. Already late, Superman heads off to work. At the staff meeting, Clark gets chewed out by Perry for his recent erratic behavior. Perry then tells him that Lana Lang is being named the CEO of Lexcorp, and that the world's foremost arcanobiologist wants Clark to cover her story. Clark says he knows her, but doesn't know what she is doing. Clark offers to cover both stories, but Perry says that he doesn't deserve the prime assignments right now. Instead, he gives Clark a stack of crap assignments. If he can get them all done then he gets the two good stories. As Lois heads out they make arrangements for lunch. Jimmy tries to guess what the anniversary is, but Clark won't tell him. Clark tries to cover a city reconstruction meeting, but a sound pulls him away. Superman finds an Intergang camouflage squad planting glowing spheres. He easily defeats the squad and turns one of the glowing spheres over to the Tech Squad. He keeps one ear on the meeting the whole time, so he should still be able to write the story later. Throughout the day, Superman defends his city while trying to cover Perry's stories. Some he can watch with his telescopic vision or listen in on, but others he's just too busy to handle. After defeating an attack by Prankster, Clark returns to the Daily Planet briefly before heading back out. After handling another story or two, Superman realizes that those energy spheres are pulsing with the heartbeat of 'Ugly' Mannheim. Superman homes in on the sound and storms a warehouse. Inside he finds Mannheim transformed into a towering giant. The two battle before Superman immobilizes Mannheim in the ground. He guesses that it's Darkseid, but Mannheim tells him that he's not even close as he looks skyward and teleports away. With the day finally over, Clark goes home. He didn't even file half of the stories Perry wanted him to, so he won't be getting the good assignments. Walking into his apartment, he finds Lois waiting for him with candles and a bottle of champagne. Lois tells him that she took his notes and filed the stories. She knew he was busy as Superman all day. Lois tells her husband that they've got the chance for a dance. The two go flying together, and Clark can't believe that it's been twelve years since they first flew together. In Kazakhstan, Clark's doctor friend stands outside the research compound. She's concerned about the tremors, but her security guards tells her not to worry. Quietly, she wishes for Clark to get there soon. Story - 5: I'll be honest. I wasn't too thrilled about Busiek on Superman. His recent work on JLA was less than stellar, so I wasn't expecting anything too fantastic. Even the last eight issues of 'Up, Up, and Away' didn't dispel my fears considering Johns' was involved with that. This issue took care of any doubts I might have had. Absolutely fantastic is a description that comes to mind. I have long been a fan of the self-contained story. Epics are great, but there's a lot to be said about telling a complete story in 22 pages. This issue contained everything I love about Superman. Superman saving the city from smaller threats is something I really appreciate. Every day can't be a crisis, and it's nice to see him just keeping his city safe. It also used the Daily Planet, and used it well. It's way too easy to forget that Clark has a job, and a reasonably demanding one, so it's nice to see him actually scrambling to handle his career. And the integration of him handling criminals while still using his super-senses was a very nice touch as well. And finally, it is so nice to see the marriage integrated into the story so well. I'm intrigued about Lana becoming CEO of Lexcorp. It would bother me, but she was the first lady for a short time, so its not really that much of a stretch, and hopefully it gets Lana involved in Clark's life without turning her into a homewrecker (I'm talking to you Chuck Austen). The reintroduction of Intergang is nice as well. I always liked the concept, but it's been quite a while since the idea was handled well. Hopefully, this marks the turning point. I can continue to break the issue down, but I can sum it up by saying that it reminds me of the late 80s/early 90s books. Intergang, a good use of the Daily Planet, supporting cast present, and a self-contained story. If this keeps up, I'll be a very happy Superman fan. Art - 4: I've had a love/hate relationship with Carlos Pacheco for awhile. I loved his work on X-men in the late 90s, but since then it's been up and down. His arc in Superman/Batman generally looked good, but I had some problems with his Superman. I'm happy to say, a lot of that has been ironed out. Clark looks fantastic, but his Superman is even better. It's really the little touches that get me. Look at his cape work throughout the issue. It's not a big thing, and you normally don't even consciously notice it, but his dynamic use of the cape adds a lot to the flying and fight scenes. Beyond the pencils though, I really need to talk about this coloring. Whatever process Dave Stewart it using, it gives each page a wonderful feeling of depth. It makes the city come alive behind Superman. Check out the gorgeous splash on pages two and three to see how great of an effect this has. The city behind them looks real, but Neutron is flying right out of the page at you. Outstanding work by everyone involved. With all of the praise out of the way, there are two things I need to mention which are the reason for the score of four. I don't know what it is, but it's ugly. Not a huge deal, but fix that thing quick. Second, the thing that ruined the aforementioned wonderful splash page. A little something I like to call, Monkey-Face Superman. I don't know how Pacheco was able to sit over a drawing table for hours producing this awesome spread, and not notice that Superman's face looks like it belongs on an ape. One bad face wouldn't be so bad, but this is the page in this issue, and that face really hurts what should be an incredible piece of art. Still, happy to have Pacheco on board. If one page out of twenty-two suffers a little, that's a ratio I can live with. Cover Art - 5: Fantastic cover. Superman's abs are a little extreme, but everything else is perfect. 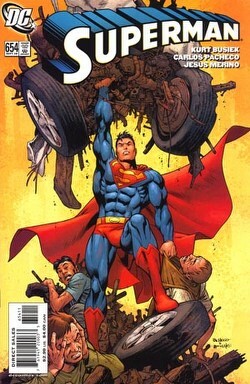 The cover continues the awesome coloring of the interior and Pacheco's great version of Superman. The best part though, is Pacheco's updating of the most classic Superman cover out there, Action Comics #1. Superman's still destroying a car, and there are still panicked criminals around him, but Pacheco updates the concept and makes it his own. This is a beautiful way to announce that this is the beginning of something new for Superman.